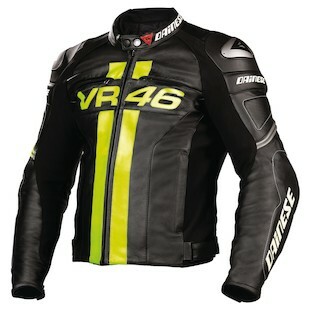 Brand new for 2012, the Dainese VR46 Leather Jacket is after the hearts of Valentino Rossi fans far and wide. The VR46 Leather Jacket is built on the chassis of the Dainese Racing Leather Jacket, one of the most popular Dainese leather jackets. 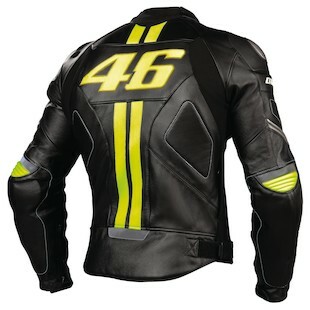 This jacket strips the Racing Leather of its branding, retains all of the standout features and technologies, and tastefully adds Rossi's hi-viz yellow color accents throughout, including the "VR46" logo. Alongside the similarly-styled VR46 Textile, the new Rossi Replica Gauntlets, and the VR46 Sport Gloves, the VR46 Leather Jacket is one of many in a formidable line from Dainese that pays homage to the greatest racer of all time. Constructed of premium 1.2mm Italian cowhide leather, the VR46 Leather Jacket has protection, style and comfort in mind. At the shoulders, Dainese uses co-injected CE rated armor topped by aluminum hard parts, protecting from impact while enabling sliding in a get-off scenario. 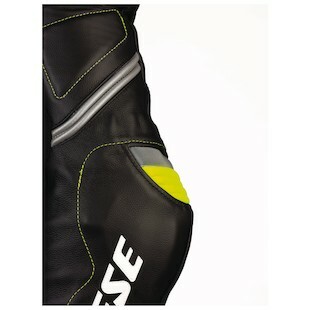 The elbows are using Dainese CE rated armor that extends all the way down nearly to the wrist for ample protection. There is also a pocket in the back of the jacket that will house a Dainese CE rated back protector, so you can really bulk up the protection that this jacket offers. There are additional foam injections on the biceps and at the back that add another element of protection in addition to a nice style. For comfort and airflow, the Dainese VR46 Leather Jacket has strategic S1 stretch paneling which allows mobility when in the tucked riding position. At the backs of the elbows and biceps, there are elasticated leather panels in addition to reflective inserts. There is a full 360º zip to connect this jacket to a pair of leather pants and get you on the track as well. Internally, the mesh comfort liner has a sanitized treatment to ensure that it won't get funky. There are air intakes at the chest with exhausts at the lower back. It's the small details, like the neon yellow stitching used in areas like the arms and back, that really set this jacket apart from the rest and make it uniquely Rossi in nature. Alternatively, if you've gotta be uniquely Rossi in nature, just sport the AGV Corsa Turtle Helmet.